New Melbourne Browncoats, Inc. | Win a signed Jason Palmer Firefly print signed by Jewel Staite & Ron Glass at CSTS on 2 August! Here’s our first CSTS Live Auction prize! 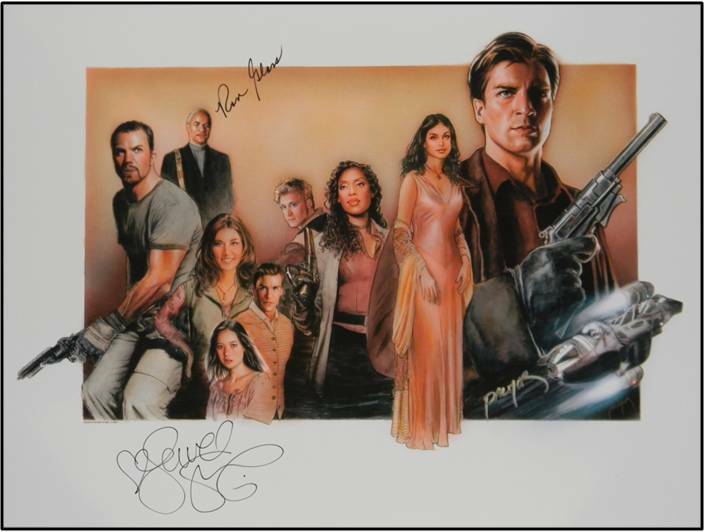 A rare Serenity poster signed by 3 cast members CSTS Live Auction Lot #3 is signed by Morena Baccarin & Lot #4 is signed by Alan Tudyk!! Win a signed Jason Palmer Firefly print signed by Jewel Staite & Ron Glass at CSTS on 2 August! Here’s the second of our five auction items that will be going under the hammer at our Can’t Stop the Serenity charity event on August 2! This gorgeous Firefly art print by Jason Palmer is signed by Jewel Staite, Ron Glass and Jason Palmer. We’re only taking bids at the event, so get your ticket today at bit.ly/csts2014. All proceeds will be donated to Equality Now and help young girls and women around the world seek justice and a better life.